Do you remember when the polite Dublin 4ers and the scornful northern unionists used to roll their eyes in disgust at Patrick Pearse’s speeches and their references to a blood sacrifice? Loony dreamer of blood-drenched dreams, a half-crazy who called others to accompany him in a doomed rebellion. And do you remember how much we heard in 2012 and after about how some of the men signing the Ulster Covenant, vowing to use whatever it took to keep Ireland in the union with Britain, used their own blood to add their signature? 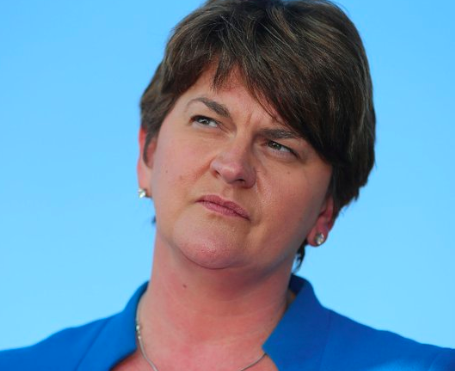 Not content with dragging the rest of us in this tormented green corner (TGC) out of the EU – even though a clear majority voted to stay – Arlene is now saying that there cannot be a border in the Irish Sea. Which is another way of saying that there’ll be a hard border in Ireland. Sweet St George and St Patrick. Where do you start with this devious thrashing around that the DUP and the Tories are up to? Some reminders, guys. Theresa: you agreed in December last that, regardless of the outcome of other negotiations with the EU, there would not be a change in the border circumstances in Ireland. You now are insisting on the need for no border checks between our TGC and Britain – even though agricultural checks between our TGC and Britain already exist. Arlene: you already ARE being treated differently from the rest of the UK. For a start, our TGC gets all that annual subvention you like to boast about. Still there, Arlene? This talk you go in for (you too, Jeffrey) about a temporary backstop is not what your PM signed up to in December. So stop pretending she did. Arlene, Jeffrey, Nigel and Uncle Tom Cobbley: re effecting changes in the Good Friday Agreement, arguing that “it’s not sacrosanct”. Forget it. Leo Varadkar isn’t having any of it, Simon Coveney isn’t having any of it, the Irish people aren’t having any of it. The Good Friday Agreement got us a malfunctioning Executive; the reasons for which malfunction are burned in hot coals into the DUP brand. But it ended violence and it enhanced the economic life of Ireland by ignoring the border. If you think, Trump-like, that you can tear up an international treaty, or amputate bits of it to suit your purposes, forget it again. Remember when Martin McGuinness counselled you to think carefully for a week or two about your refusal to stand aside and let an RHI inquiry get under way – and you refused? That worked out well, didn’t it? If you bring about a hard border in Ireland (which some of us think was always your goal) and plunge us all into an economic and political abyss, there are an awful lot of people, not least unionists, who will remember your bone-headed wall-butting stupidity and will never forgive you. In short, you’ll have signed the death warrant of the DUP. Remember one hundred years ago? When partition was first imposed on Ireland at gun-point? Not everybody liked that. Republicans fought a bitter civil war over it. If a hard border is put in place now, for many young people – and not so young – this will be like the imposition of partition for the first time. They’ll be livid at the massive disruption, and there will be some of them who’ll no doubt decide to resist it, by whatever means. In 1967, a lack of democracy and equality brought people onto the streets in the civil rights movement, which soon descended into bloody warfare. We all pray that this won’t be the case this time – but you are living very, very dangerously, Arlene. Bright light in the pervading gloom: this time, unionism won’t simply be confronted by the opposition of the entire Irish people. It’ll be faced by the united strength of twenty-six other EU countries. Arlene, you once urged those calling for a border poll to be “careful what you wish for”. Right back at you.